Z and I took our first trip of the summer to the local library today. I tried to take him a couple of weeks ago but he said "no library ... bookstore". He loves to read books over and over and so he likes to own them. I'm guessing we are going to have to purchase at least one of the library books we borrowed today. I understand his feelings -- I too like to be able to pull out my favorite books on a whim. It's no different than owning a DVD, I suppose. 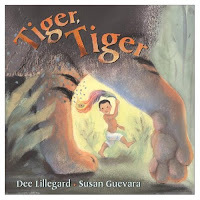 The first book he chose for himself was Tiger, Tiger by Dee Lillegard and illustrated by Susan Guevara. I thought, "that's strange, sounds like William Blake" and sure enough they had the first stanza of the poem, "The Tyger", before the story. The story itself interprets the poem into a tale about a young boy who imagines up a tiger and then, when it becomes too intimidating, imagines it away again while seeing the tiger in himself. The story tries to have its own prose style but I find that it loses its flow. I know that Z chose the book because he likes tigers but I think that he seemed to understand that this tiger was more abstract, symbolic even. No really, he did. 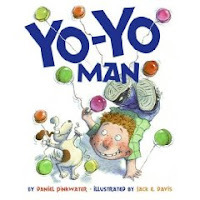 I picked out Yo-Yo Man by Daniel Pinkwater, mostly because I have read his writings about other authors -- and enjoyed them -- but hadn't read any of his own books. Z was excited about the book -- he used to have a yo-yo but then the cat ate the string -- but once we got home, he decided that he was against reading it. This happens sometimes with him. We get a book or a movie on Netflix and he absolutely refuses to try it out. Sometimes it's just a matter of time and he will eventually become curious and pick it up. Other times, he holds an unexplained grudge against the book or movie (or song) forever. 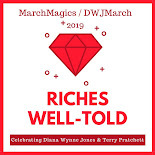 We will have to wait and see with this book but I will probably keep it around longer than the others to give it a chance. Z is also very fond of board books. Today we picked up From Head to Toe, another gem from Eric Carle. This one is great because it teaches body parts by incorporating movement and using animal examples. I'm not sure that any kid is a bigger fan of Eric Carle than Z is. I have even considered getting Z the bedding that I found on Carle's website. The first book Z learned to read was Brown Bear, Brown Bear, What Do You See? So, as you can probably guess, we have already read this new book half a dozen times today and will read it many more times before I sneak it back to the library. And the next time we are at the bookstore, I can almost guarantee you that he will find it on the shelf and pick it up. Buy Tiger, Tiger , Yo-Yo Man and From Head to Toe on Amazon or, by all means, find them at your local library. My 8yo and I adore Eric Carle. His books are so interactive.